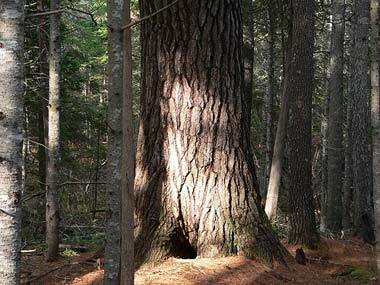 In the hill and river confluences of western New England, a ring of 'peace' communities spontaneously emerges around the Trees of Peace grove in MohawkTrail S.F.. Poised between pagodas of peace this grove of old growth White Pines give symbol and meaning to the word and intent of PEACE, as hub of this peace wheel. ‘Trees of Peace’, is a self organizing circle of people, place and purpose, a sacred space conjointly created for the joy and contemplation of all. 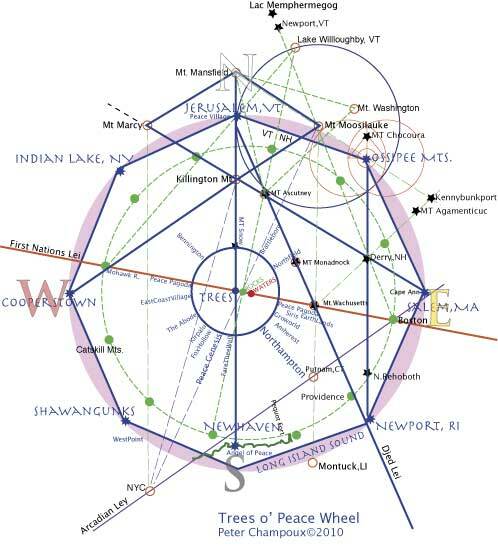 Centering on the Trees of Peace grove in Mohawk Trail SF this frequency of peace is set by the axial tonal alignment of the grove of trees and two Peace Pagodas. The Trees of Peace grove was inspired by Jani Leverett, a Cherokee Grandmother now in spirit, who dedicated these trees to living native elders to hold their prayerful intention as a living ancient forest. 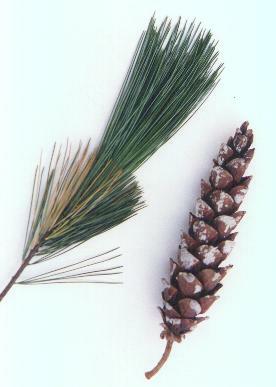 In symbolic resonance with the tree of life, this grove of White Pines of Peace coalesce diverse communities and spiritual centers into a wheel of prayer. America has myth of war a-plenty, but what is it’s myth of peace? The anglo Pilgrims imagined this new land(to them) to be a ‘new’ JerUSAlem(a place of peace). Thus, they set a new mythic ‘Image’ as an expression of peace in place names. Ultimately the purpose of both the land and its people is to live in peace. Yes,?! They saw it in the landscape.This intent remains as part of this land. 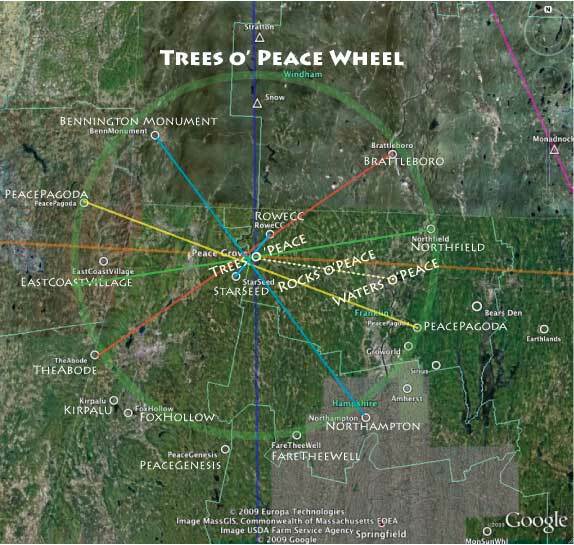 The expanded ring (x4) of the Trees of Peace Wheel, marked by New England's JerUSAlems, includes multiple museum holdings of sacred objects from the directions, tribal centers of the Pequot and Naragansett Peoples all circling around the Trees of Peace as honored memory. 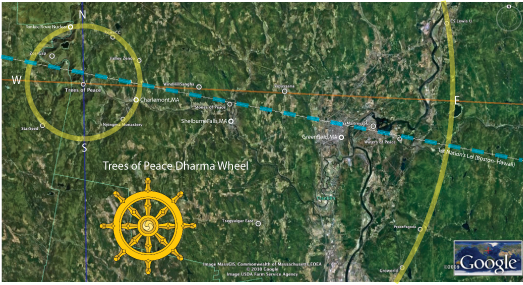 Delineating this wheel as a hidden temple are the ubiquitous placements of Buddhist sangas arrayed as spokse of dharma around hub of multiverse. Curious to note the nuclear and military posts as counter point in this array. Dharma centers haved nested in the hills of Western Massachusetts. Multiple Buddhismsects have clustered around this center holding space for the Trees of Peace to.... GROW. While Western Massachusetts has no pyramid or Stonehenge its sacred essence is proclaimed by nature’s many cities, rivers, mountains and coasts lines that all point to this holy ground. Western Massachusetts' sacred character is further attested to by its spontaneous geometrical self organizing colleges, communities and monasteries. 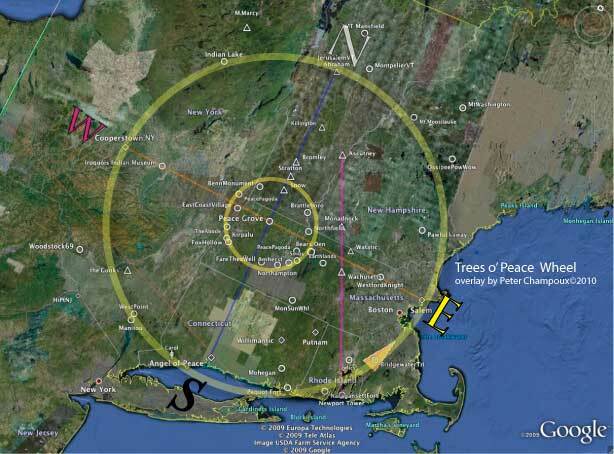 Nature and human culture conspire and point to these ‘Trees of Peace’. 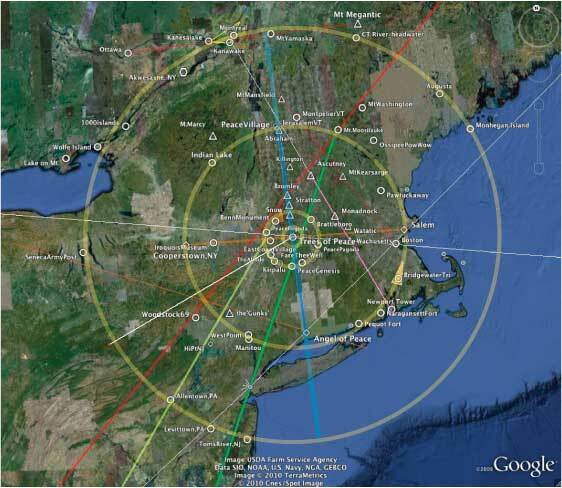 Implicate to this conversation is a world view where western Massachusetts is the geologic, cultural and spiritual center of North America; giving local action a global context. Peter reminds us of our duties as gaian terraist empathizers to 'be good', as ‘we are the world’. Expanding the ring Saint Lawrence River shows its ripple expansively drawn by: the South, Great Lakes and Maritimes; Baja and Iceland. Peter Champoux: presents this latest study on the ‘field’ phenomena of landscape geometry. Champoux (pronounced shampoo) born to a pile of rock in Holyoke, MA, has been a professional classical stone mason, an environmental artist, self educated geographer, farmer, author (Gaia Matrix), teacher, geomancer, dowser, techno- peasant... Peter’s landscape geometries are environmental models developed from a synthesizes of ‘what is’ into a new myth and potential model for spiritual, social and planetary cohesion. His vision blends geography, ecology, history, art, math, myth, and mystery, hence the name GAIAGRAPHY. Peter’s gaiagraphic field phenomena geometries are two dimensional graphics of 3D etheric bubbles suggestive of an ultra dimensional field effect. 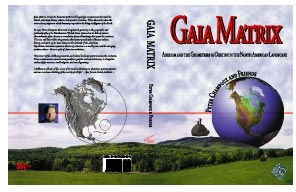 Gaiagraphy is an art, science, and practice that maps consciousness: human and terrian. Like the wind and water or Feng Shui, ether, or the field, GAIAGRAPHY is a force of nature revealed in the our shared sacred landscape.